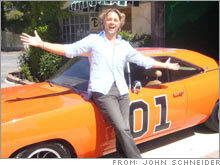 After $10 million bid falls through, actor John Schneider plans to put the car back on eBay. This time, bidders will be screened. NEW YORK (CNNMoney.com) -- The General Lee is going back for another run. After commanding a winning bid on eBay of nearly $10 million, a bid that fell through after the alleged bidder claimed his on-line account had been hacked, the owner is planning to try again. The car will go back up for auction on eBay next week. This time, though, John Schneider, the actor who played Bo Duke in the series The Dukes of Hazzard, isn't taking any chances. Schneider says he's hired a company that specializes in pre-screening auction bidders. Auctionwire, the company working with Schneider, requires bidders to prove they have the funds available prior to bidding and also requires a bank's guarantee that the funds will be paid out at the end of the auction. Bidders will be able to apply starting Monday at ebay.com/generallee. The auction itself will begin the following Saturday afternoon, a spokesman for Auctionwire said. The car being auctioned is a modified 1969 Dodge Charger that appeared as the General Lee in The Dukes of Hazzard. The car has been further modified since itsTV career and now has a 725 horsepower Hemi motor, Dodge Viper brakes and a roll cage, all of which allow it to race at more than 200 miles per hour. Ordinarily, a production-used General Lee would be worth about $150,000 to $200,000, McKeel Hagerty, president of Hagerty Insurance, a collector car insurance company said in an interview before the end of the car's last auction attempt. About 20 of those are known to exist in reasonably good condition. The opportunity to buy the car from "Bo Duke" himself would add some value, he said. Part of the proceeds will go to a charity that is yet to be named, Schneider said. In an auction that ended May 4, bidding for the car went up $9,900,500. But the winning bidder, William Fisher, maintained that someone else placed the bids in his name after gaining access to his eBay account. "Our Trust and Safety team has been following this listing closely," said Catherine England of eBay in an e-mail. "They've assured me that the bidding activity from the winning bidder on the General Lee listing was legitimate and there is no evidence to suggest that the bid may have resulted from a compromised account." Ebay also said they had warned Schneider to carefully pre-qualify bidders for the previous auction attempt, something Schneider admitted he had not done. Prequalifying bidders was not something he or his associates had any experience with, Schneider said. He runs an eBay store that sells Dukes of Hazzard paraphenalia such as license plates and posters. "Who can't buy that?" said Schneider. During the course of the auction last week, eBay officials themselves disqualified several bids and went so far as to contact several of the top bidders to verify their offers, an eBay spokeswoman had said earlier.